Sherwani is basically a coat which is long in length, it is generally below the knees; it resembles achkan and is buttoned up to the collar. It is a traditional outfit that adds grace and charm to the personality of a man especially if you are tall. 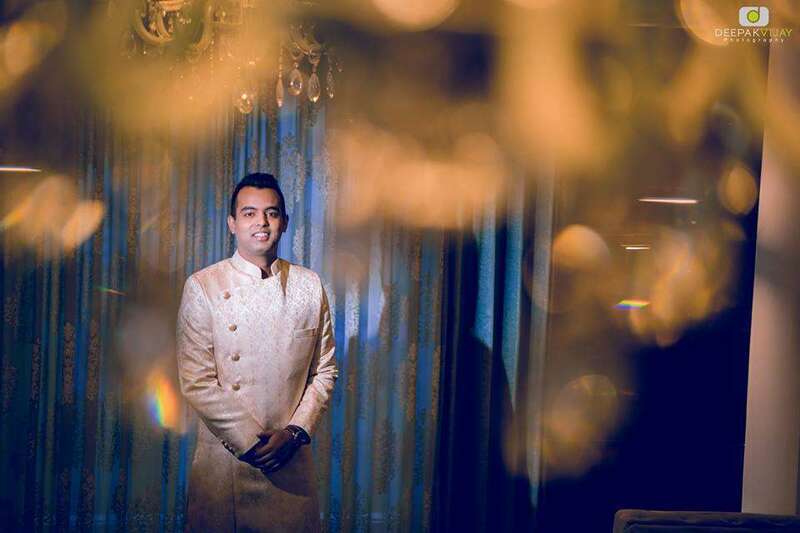 In India, men spend a huge amount on purchasing the best sherwani suit for their big day i.e. their wedding day. This outfit has been the favorite traditional outfit in almost every culture, religion, etc. of India. Thus, it has been enjoying huge demand for centuries. Generally, a man dons sherwani over a kurta at top and churidar pajamas at the bottom. 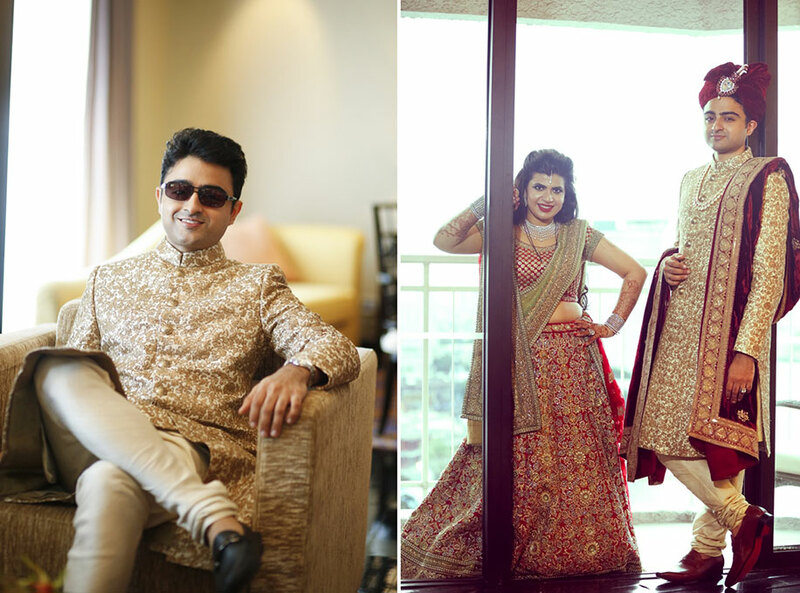 Sometimes, the latest groom wear trends include sherwani’s paired with salwars at the bottom. As per the studies, sherwani was first used in Central Asia during the Mughal and Delhi Sultanate times. The Persian nobles used sherwani’s as their dress code, then with time common people also admired it and started wearing it. 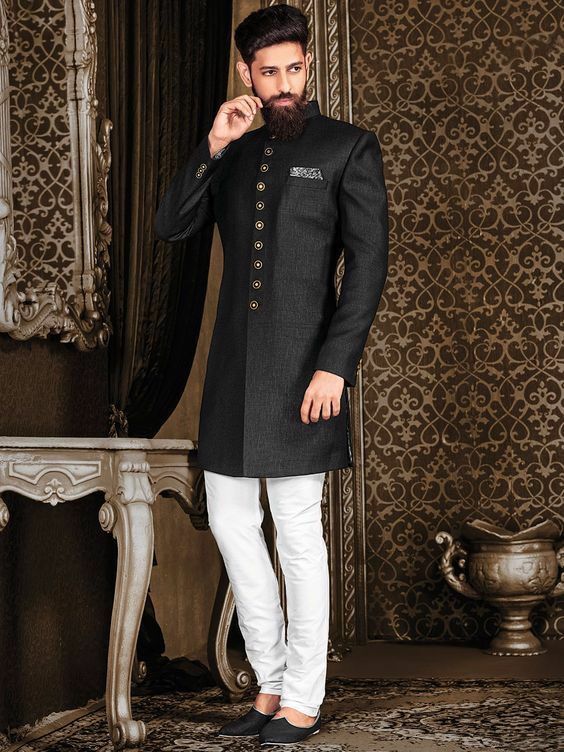 Sherwani is actually the national dress of Pakistan for men whereas; in India sherwani is worn on important occasions or on traditional functions. This outfit has its own charm and significance. It has become a must for the wedding. If you are getting married in sometime… you must have heard people asking you what are you done with your sherwani suit shopping or not. 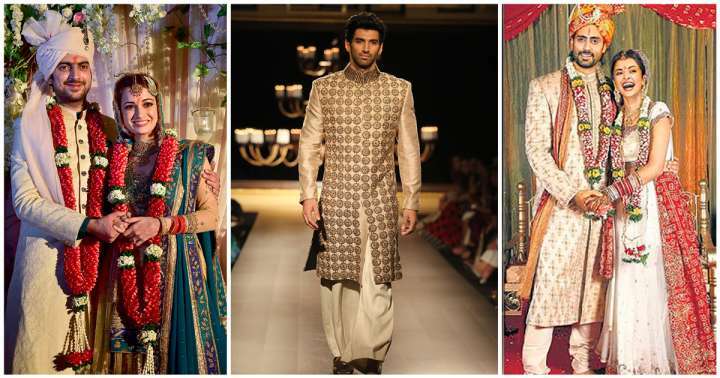 This is because; sherwani has become as important for our wedding celebrations! 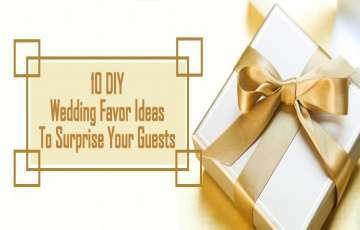 People look at so many designs, stores or contact famous designers to get the right outfit for their wedding day (which is, of course, the most important day of your life and you want to look your best). 1. Jodhpuri style Sherwani– Jodhpuri styled sherwanis is very famous for their regal look. 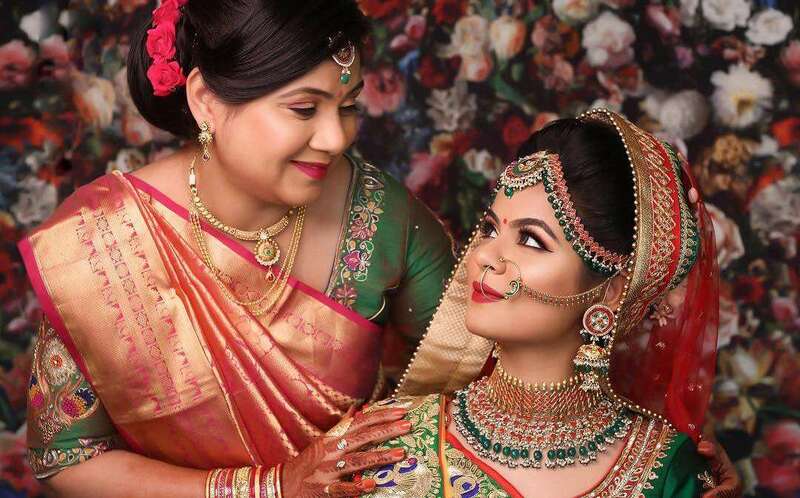 It is a perfect fit when it comes to buying something to wear on an auspicious and special occasion. People from different parts of India visit Rajasthan to buy sherwani for groom in Jaipur and Jodhpur. This is because the groom wear in Jaipur is extremely famous in India and most of the creations are inspired by Jodhpuri designs, only. Jodhpuri style sherwani is a very popular and regal style which is often used as the groom’s outfit for a royal wedding. So, the enthusiasm of a royal reception stays incomplete without the selection of the perfect jodhpuri sherwani for the groom. The designer with years of experience and knowledge work on these sherwani’s to create something nothing less than a marvelous outfit. This is why, generally jodhpuri sherwani collection comes with a limited edition warning, plus, it is a bit costly too. You can pair your sherwani with stoles, churidar and gemstones accessories to get the best look out of it. The major designers of Jodhpuri Sherwani are Raymond andRrajwadi. 2. Hyderabadi Style Sherwani– This form is inspired by the traditional era for reflecting a taste of royalty. The designs are enthused by the Golden period of India along with the balanced touch of the contemporary world. This sherwani will remind you of the Hyderabadi Nizam’s and nobles. So, if you wish to add royalty to your appearance, then this is something you will definitely need. Royal styled cuffs are used to give it a perfect look. It is easily available in a variety of contrasting shades, vibrant colors, designs and patterns. You can pair it up with stylish cufflinks, a stole, or a sherwani jacket to get the best regal look. 3. Pakistani Style Sherwani– Since sherwani is the national dress for men in Pakistan, therefore, their designs and creations are famous in all parts of the world, today. The Pakistani sherwani is an extremely ornamented outfit used as an ethnic wear. The Pakistani designs have given an entirely unique dimension to this outfit. This unique occasional wear has made its way to India, because of its beautiful designs. It is widely used in Indian weddings mainly due to its charm, attractive colors and bodice work. 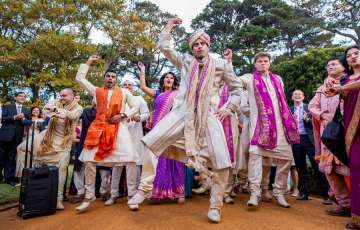 Not only the grooms, but even the close relatives of bride and grooms plan to buy Pakistani sherwani’s for weddings and other occasions. You can easily pair a Pakistani sherwani with churidars and gemstone buttons and cufflinks. The biggest brands that offer best Pakistani Sherwani are Manyavar and Raymond. 4. 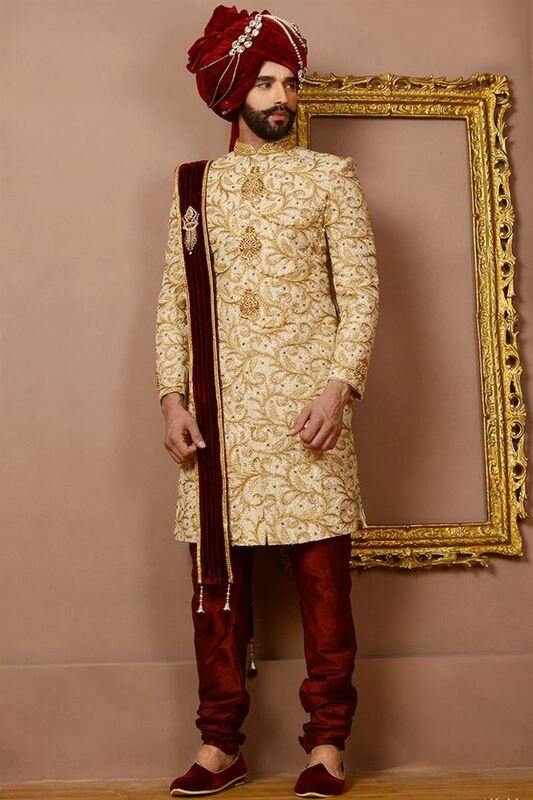 Punjabi Sherwani– These are exclusively designed for the Punjabi grooms (Munda). These Sherwani are designed with a touch of modernity coupled with traditional patterns. These are generally printed outfits rich in different artwork and designs. 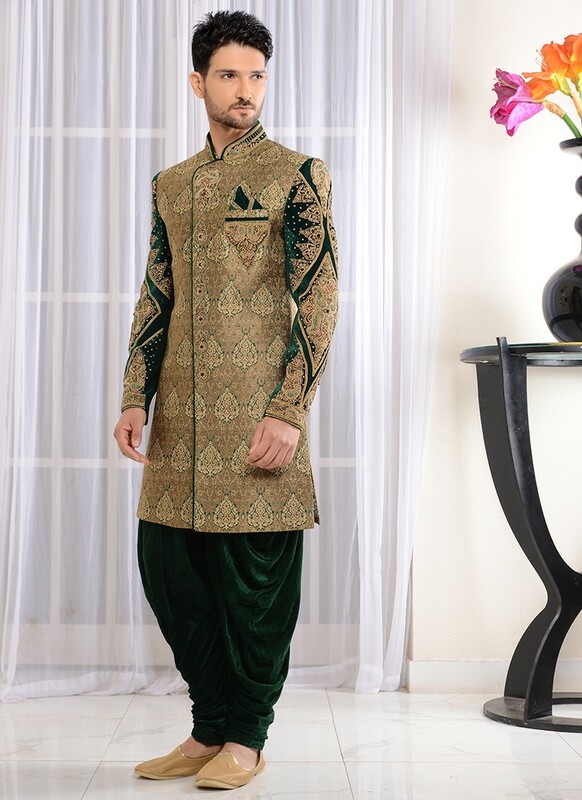 This type sherwani makes you look picture perfect and delivers you with a confident and smart look. You can simply pair your Punjabi sherwani with pins, chains, and cufflinks to enhance its look. Diwansaheb and Manyavar are biggest sellers of Punjabi style sherwani. 5. Achkan Sherwani – If you want to maneuver the best outfit for your wedding, then you need to look for something that is trending on the fashion world & one of such outfit is the Achkan style Sherwani. It is one of the most famous Indian sherwani’s that work as a perfect choice for wedding day outfit. You can simply pair you Achkan Sherwani with a dhoti style pajamas or with a churidar to create a magnificent look. Fashion Curries and Peter England can be visited to check out Achkan Sherwani. 6. Jacket Sherwani– You can also try the trendy jacket style sherwani to get a princely look at your wedding. It is available in Banarsi, Jamwar, Tussar and in many other beautiful fabrics. The Sequins and antique work on jackets are quite impressive. You can pair your jacket sherwani with long pajamas and modern juttis. Samyaak stores can be visited to check out the latest jacket style sherwanis. These are the top six trending Sherwani suggestions for grooms that will make them look the best at their weddings. Thanks for sharing this article. 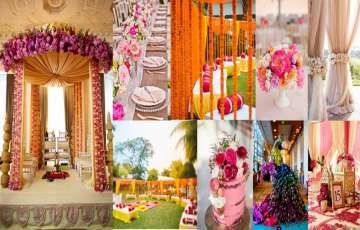 This article is very useful for me and i also just want to know the best Sherwani shops in Delhi. 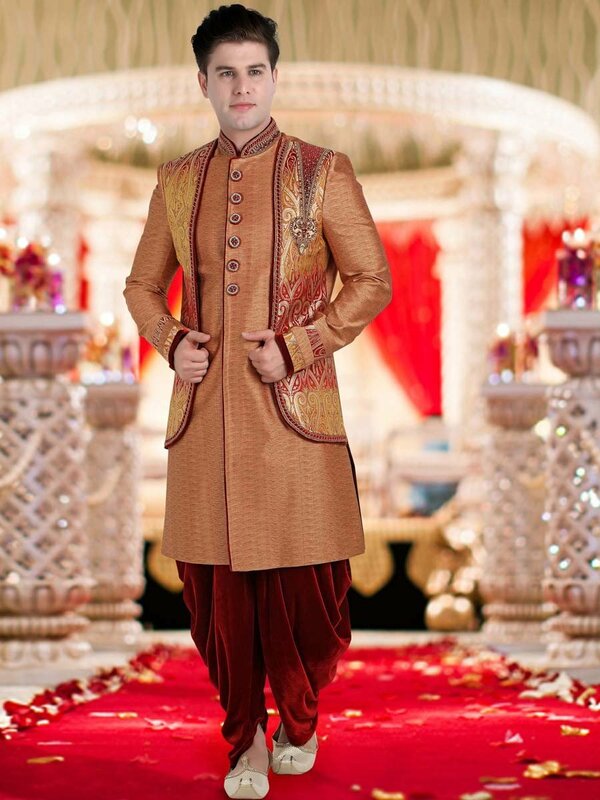 You can find best Sherwani shops in Delhi from our find a vendor section. 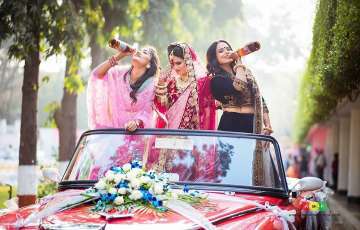 Top Best 21 Indian Baraat Songs: #11 is Jhakaas! I’m Madly in Love With These!